Singapore’s national water agency, Public Utilities Board (PUB), and National Environment Agency (NEA) found a new method of using both waste water sludge and food waste to generate biogas. This biogas can power a large portion of the country’s water treatment plants. Harry Seah, PUB Assistant Chief Executive, Future Systems and Technology said that the positive result from the trial of the new method shows that it is possible to make the used water treatment process in water reclamation plants to harness more energy. 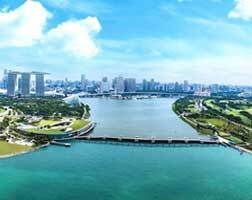 The 2-year trial of NEA and PUB, which bore positive result, will be implemented at Tuas Nexus, a first-in-the-world greenfield development that comprises the Tuas Water Reclamation Plant and the Integrated Waste Management Facility (TWRP-IWMF), when it opens in 2025. NEA and PUB started the trial of combining water sludge and food waste last December 2016. The trial used water sludge from toilets and food waste at the PUB’s facility in Old Toh Tuck Road. The wastes were collected from 23 premises across Singapore, including Tian Sheng Fresh Produce, Maju Camp, and University Town at the National University. These organisations were required to segregate food waste from other types of general waste. Currently, the water sludge and food waste are processed separately to generate biogas. Water reclamation plants in Singapore use biogas from solid materials from household waste water or water sludge, which is then used to power the plants. But when the food waste and water sludge is combined, yield of biogas is tripled. The trial showed that the mixture of food waste and sludge could increase efficiency of biogas production by 200% compared to processing sludge alone; and an increased by 40% compared to processing both materials separately. Singapore’s four water reclamation plants, including the Ulu Pandan facility supply 25% of the plant’s electricity needs through biogas from sludge. By the new method, the plants can supply 40% of its electricity needs due to higher calorific valued in food waste. Furthermore, Vivian Balakrishnan, the Minister for the Environment and Water Resources enquired that since a significant amount of energy is used to incinerate food waste, why not recover the energy from food and use it to recycle used water? She added that the project potentially increases the yield of water from the recycling plants, thus making it significant.